Patrick Harmon was my great-grandmother’s grandfather or my third great-grandfather. The further back in time I go the less documentation is available and what I know and am likely to learn grows scant. It is believed that Patrick, who was born in Maryland in about 1790, was the son of Joseph Harmon; the name of his mother is not known. In my blog about his son, Thomas Benjamin Harmon, I postulated he married sometime before 1818 to a woman who died sometime before 1822. He was listed in 1813, when he was about 23, on the Grayson County, Virginia tax lists as having 1 horse on which he paid a tax of $.16 in addition to his tithe [tax]. The other Harmons who were listed on the tax list [meaning they were over 21] were Joseph and John, Sr. John had 3 horses and paid $.48 cents in addition to his tithe while Joseph had no horses and paid no tax, which likely meant he was beyond the age where he was required to pay taxes. There is an 1820 census for Joseph Harmon that appears to have two families living together: an older couple [over 45] and a younger couple [26 to 44] and a male child under 5. I suspect these were Joseph and his wife and Patrick, his first wife, and Thomas Benjamin. 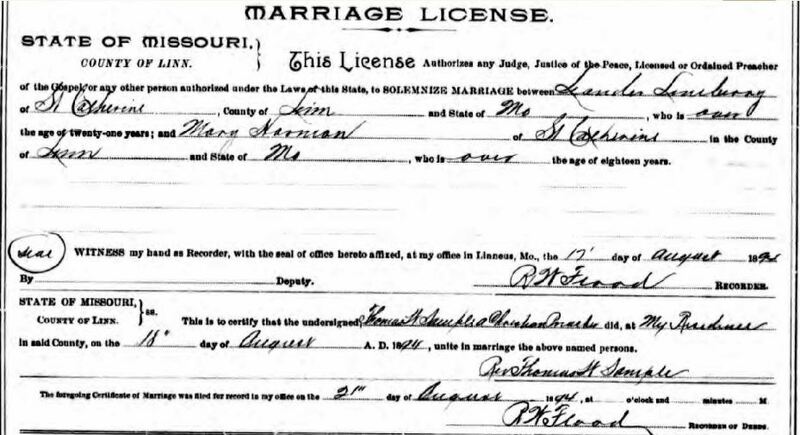 Patrick married Mary “Polly” Melton in Grayson County sometime between September 16, 1822 when a marriage bond was posted and December 26, 1822 when the marriage certificate was returned. Patrick’s 1822 marriage is an indication his first wife died, perhaps in childbirth at the birth of Joseph in 1821 or 1822. The 1830 census for Grayson County for Patrick’s household suggests a family of a husband and wife, four sons and one daughter. Because it is a tic mark census, the only information is the age and gender of the people living together. Patrick’s oldest son Thomas married in 1838 so for the 1840 census,the tic marks reflected a family of a husband, wife, five sons and three daughters. Dates on a fairly recent headstone indicate Patrick was widowed a second time when Polly died in 1849. Her death is supported by the 1850 Carroll County census that has no mature female adult in the household. The change of county from Grayson to Carroll County reflects the creation of Carroll County out of a part of Grayson County in 1842. Patrick (60) was listed as a farmer with property valued at $500; six of his children still living at home were enumerated: Elizabeth (25), William (21), Rebecca (14), Nancy (10), Wilson (7) and Polly (5). Thomas, Joseph and James had married and established homes of their own. 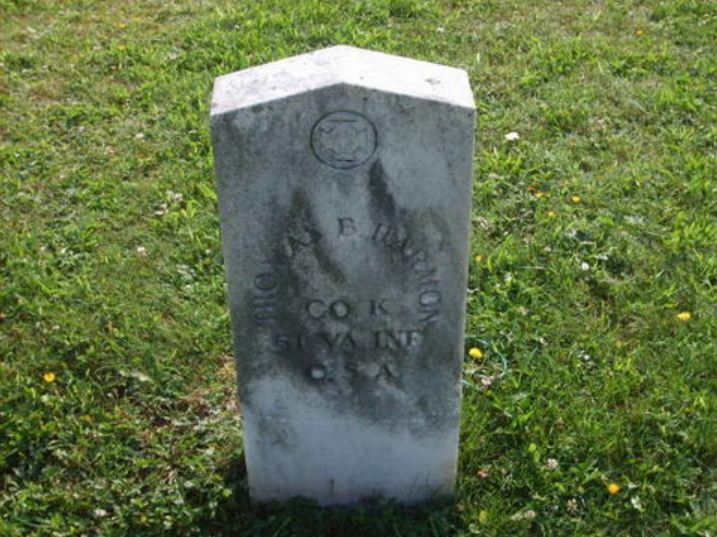 Patrick died in 1857 and is buried in the Melton Cemetery in the Mount Zion Community of Carroll County. Someone in recent times has placed a double headstone there for Patrick and Mary; a photo of the headstone was uploaded to their FindAGrave memorials by Donna Sutphin Armentrout. 1. He was my great-grandmother Rhoda Harmon Lineberry’s father. The 1850 census lists Rhoda in that family. Additionally, a Virginia marriage index for Rhoda lists her parents as T. and D. Harmon [Thomas and Delilah]. 2. He was born in Virginia, probably in Grayson County. Censuses for 1850, 1870 and 1880 all confirm his Virginia birth. His father’s records beginning in 1822 reference Grayson County. 2. He married Delilah Davis August 23, 1838 in Grayson County, Virginia. Although marriage indexes list these details, Martha Fontaine Patterson uploaded a digital photocopy of the marriage license dated August 15, 1838 in which Thomas and his father posted a marriage bond. 3. His father was Patrick Harmon. Patrick was the name of the co-signer on the above-mentioned marriage license. Although that document does not provide evidence that Patrick was his father, Thomas’ second marriage application reinforces that interpretation by naming Patrick Harmon as his father. 4. Based on the 1850 and 1870 census, it would appear Thomas and Delilah had at least eleven children: Sarah, Mary “Polly”, Elizabeth, Nancy, Rhoda [my great-grandmother], Alexander, Joseph, Daniel, Henry Coulson, Thomas J., and Joseph Clark. 5. Thomas probably served as a private in the 51st Virginia Infantry, Company K, of the Confederate Army. Although I have not found his name listed in the CSA soldier record cards or roster lists, his widow [Margaret Mabe Harmon] applied to the War Department for and received a CSA headstone to place on his grave. 6. In November 1888 when Thomas was about 70, he was widowed when his wife Delilah died. The Virginia Death and Burials Index as well as Delilah’s tombstone provide support for this information. 7. He married Margaret Mabe on November 24, 1890 when he was about 72 years old; this marriage is reported in the Virginia Marriage Index. 8. Thomas and Margaret had three children: William Early, George Benjamin and Laura Louvenia. 9. Thomas died October 17, 1898, as listed in the headstone application above. 10. 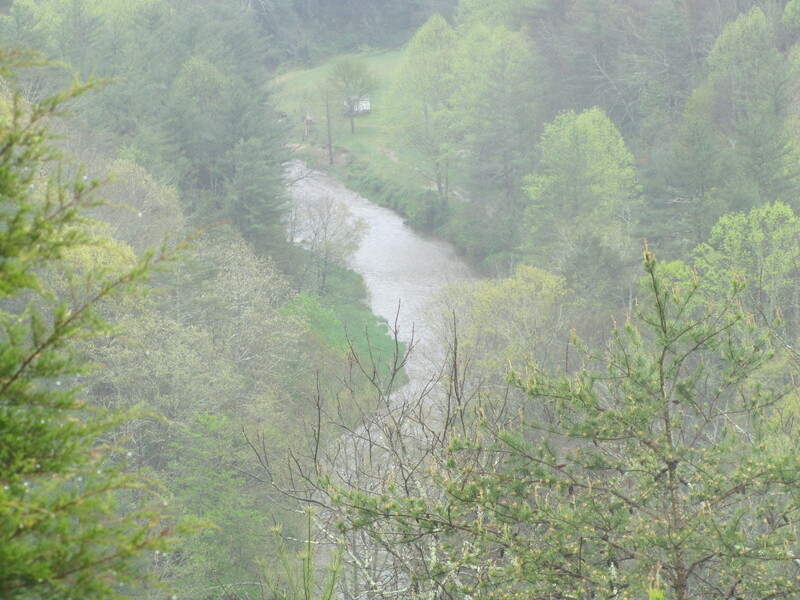 He lived most of his life in the same general area of Grayson, Carroll and Wythe Counties in Virginia based on census records from 1840, 1850, 1870, 1880 as well as burial records. The missing 1860 census, of course, could be an indication he was away from the area during some of those years. His father-in-law and at least one brother-in-law moved to Ohio for a few years but I have not found records of Thomas having joined in that adventure. The records above cover a basic framework for Thomas’ life but two important details remain evasive – his birth date and the name of his mother. The evidence available for interpretation would be the 1850 census, which listed him as 32 ; the 1870 census, which listed him as 51 ; the 1880 census, which listed him as 60 ; and the 1890 marriage license, which listed his birth year as 1822. Based on the census records, his birth year was most likely sometime around 1819. The date reported on the marriage license might be explained by a slightly prideful deception – his new wife was approximately 30 years his junior. During these years of our country’s history, births were not required or recorded unless in church minutes or family Bibles, or perhaps in wills or pension applications, so an actual date will not likely be uncovered. 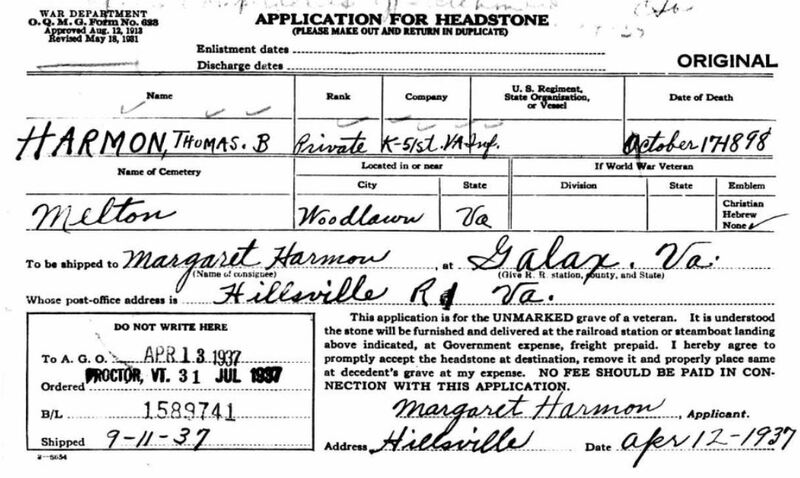 Even though the license for Thomas’ marriage to Margaret listed his mother as Polly Harmon, the range of date possibilities for his birth leaves in question the full name of his mother. 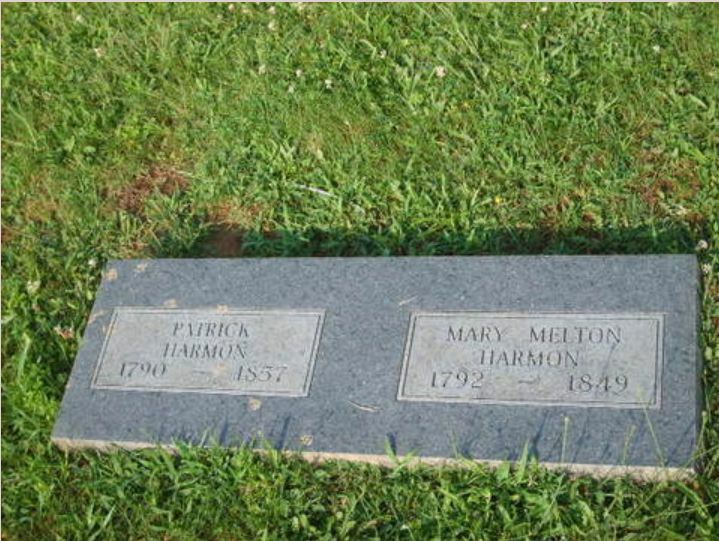 Thomas’ father, Patrick Harmon, married Mary “Polly” Melton on December 26, 1822. 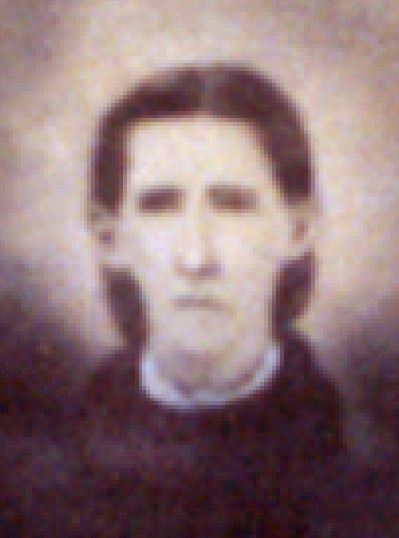 If Thomas were born in 1818, 1819 or 1820, Polly Melton Harmon was not likely his mother. On the other hand, if he were born in 1822 as listed on his second marriage record, he might perhaps have been the son of Patrick and Polly [albeit an early birth based on the marriage date]. The consistency of birth dates over the period from 1850 through 1880 lends credence to the earlier date for his birth, which would indicate Patrick had been married before his marriage to Polly Melton. At the time of the 1822 marriage, Patrick was about 32 and Polly 30, which would lend support for there being time for an earlier marriage. Unfortunately, thus far I have not found any records to support a name or date for such a marriage. So, for now, I have his mother listed as an unknown woman who married Patrick Harmon prior to 1818 and died prior to 1822. Thomas was buried in the Melton Cemetery as was Delilah [the photo below was uploaded to FindAGrave by Donna Sutphin Armentrout]. Genealogy is a constant learning process. In the beginning stages, the question may be, who were my great-grandparents. Learning a name and where they lived fills in an empty spot on a family tree and for many that is sufficient. But once a name on a tree is not enough and you decide to look for documentation to track where they lived and worked, bore their children and are buried, the need for careful examination and evaluation of what you find becomes important. Yesterday, as I was trying to clear up a death date – to which of the multiple Leanders did it belong [I had the same birth/death dates for two Leanders – one in Linn County, Missouri and one in Carroll County, Virginia]. Although the Virginia death date came from the family Bible, it was beginning to look as if it were the one in error]. In this process, I came across a perfect illustration of why it’s important to analyze the data from the documents you find. Although the search began with Leander Lineberry, eventually the bigger question of the moment became who were the parents of Robert J. (R.J.) Lineberry. I started with information from the 1900 census for Linn County, Missouri for Leander Lineberry, which showed him with a second wife [first wife, Prissilla Coulson Lineberry, had died in 1893]. This record shows that he and his wife, Mary, have been married for six years and that she is the mother of one child born/one child living. She is recorded as 52 years old, which would mean she was over 45 when a child of that marriage would have been born; however, there is no child enumerated within the household. The most logical interpretation for this information would be that her child had been born in a previous relationship, but at this point only a guess. When I looked at the 1880 census for Mary Harmon, I found her living with her sister, Elizabeth Harmon and her husband, Joseph H. Lineberry, and their children. By the 1880 census, relationships within a family unit are listed; the relationships are listed as to how they are related to the head of household. Typically, a census lists the core family as a unit before listing any other people living in the household. Since that is not the case here, it is cause for wondering why. The core family would appear to be Joseph and Elizabeth and two children, Patrick L. and Harriet A. with Mary Harmon as a sister-in-law living with them. The insertion of Robert Lineberry below Mary as a son of the core family is a little unusual and the main reason for further consideration. The 1870 census for Mary sheds a little light on the situation. Joseph and Elizabeth are shown on the previous page, which I have not copied; at the top of the second page are three of their children – Wilburn, Alverdo and Patrick. In the next household [this enumerator seemed to place the household numbers at the bottom of a family unit rather than at the top], Mary Harmon is enumerated with her son, Robert Harmon. Since Harmon is Mary’s maiden name, it leads to a possibility of his birth being outside of a marital relationship [it would not be unheard of for her to have married someone with her same surname]. This listing does seem to support the interpretation from the 1880 census that the listing of Robert underneath the name of Mary rather than underneath the core Lineberry family was not an accident. 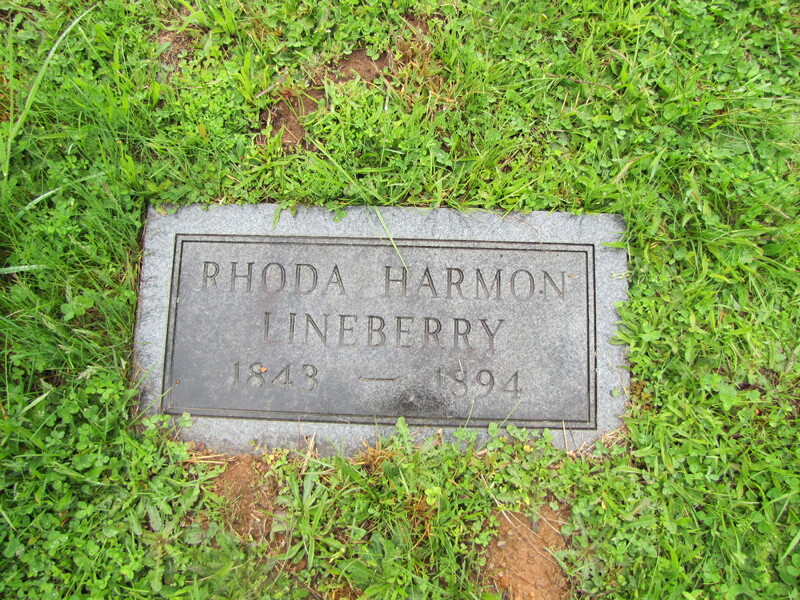 It does not, however, address the name change from Harmon to Lineberry and whether this was an enumerator choice or reflected some surname shift. Checking with Ancestry.com family trees for Robert Harmon Lineberry does not show anything for the Harmon name, but does for Robert Lineberry. Every tree shows him as a son of Joseph and Elizabeth Harmon Lineberry. If one stopped at the 1880 census and the listing of him as a son of the head of household without considering his placement on the census form, that would be the conclusion. This record shows R. J. living in a presumably unrelated household, listed as a servant but [not shown in this image] also working as a saw mill hand. He is listed as 35 and widowed; I have not yet discovered a marriage record to account for the widowed status. Here is the more telling piece of the puzzle: both he and his mother were listed as born in Virginia but he doesn’t know the birth location of his father, which would not be the case if Joseph Lineberry were that father. 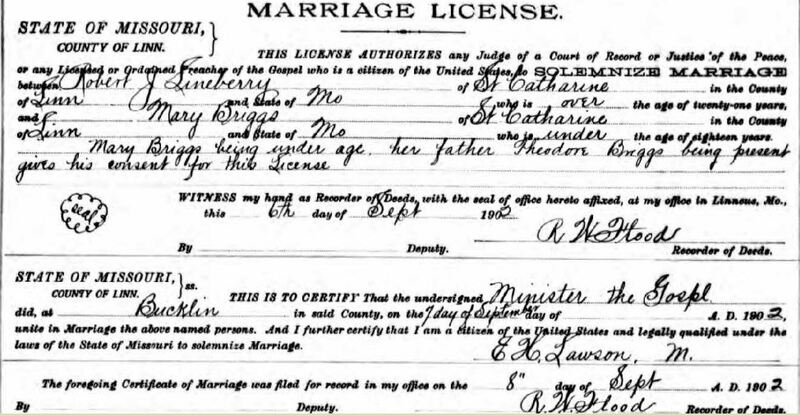 Still with the name of Robert J. Lineberry, two years later, there is a marriage record for him and Mary J. Briggs. This 1910 record supports several items of interpretation even though it is an enumerator mess – please note the head of household is listed as Mary Lineberry [who only picked up the name of Lineberry in her 1896 marriage so not pertinent to the 1865/66 birth of her now known to be only child]; this Mary is widowed and 64, while her mother-in-law is also Mary Lineberry who is widowed and only 24. Additionally, Robert is listed as a female born in about 1907 – Robert was, in fact, a male child who died in 1909 while there was another male child, Theodore, who was born in 1909 but is not listed. That misinformation notwithstanding, we can now see that Robert’s mother was not Elizabeth Harmon Lineberry, but was Mary Harmon Lineberry – she, once again is listed as having had one child, this time deceased, while Mary Briggs Lineberry is the mother of four children, one of whom is deceased [Robert, the who is the one listed as living]. A marriage record for Beulah Lineberry, the child listed in the 1910 census] shows her mother as Mary Griffin who had to give permission for her underage daughter to marry, which record, combined with the obituary, tells me Mary Briggs Lineberry Griffin continued to provide a home for her mother-in-law until her death in 1921. Although I still do not know when, why or how Robert Harmon changed his surname to Lineberry, I believe it is clear from the record that he did. I also believe that since Elizabeth Harmon Lineberry was not his mother, it is not likely that Joseph Lineberry was his father [though such complicated relationships are not unheard of] – the 1900 census record stating he did not know the birth location of his father is also supportive of the interpretation that Joseph was not his father. I have not searched for any possible legal name change papers, but it is highly probable that due to being raised in the home of his aunt and uncle, Joseph and Elizabeth Lineberry, and to avoid the difficult issue of illegitimacy, and going to school with his cousins that the name merely evolved over time. It is also clear that his relationship with his mother remained over that same period of time, in spite of a name change. Without taking the time to analyze as broad a spectrum of the paper trail as is feasible, the names and relationships on a family tree are likely to contain a relatively large degree of misinformation and error. To utilize an expression most of us heard when we were growing up – “If something is worth doing, it is worth doing well.” Genealogy or filling in names on your family tree is a great illustration of that family adage.